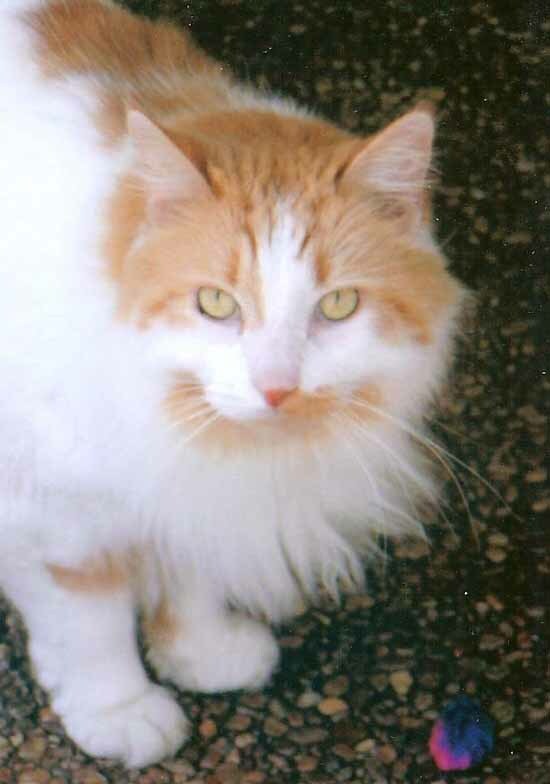 But sometimes the season just doesn’t seem long enough…and that’s how it was with Cinnamin, the beloved cat of my dear Florida friend, Judy Ditfurth. 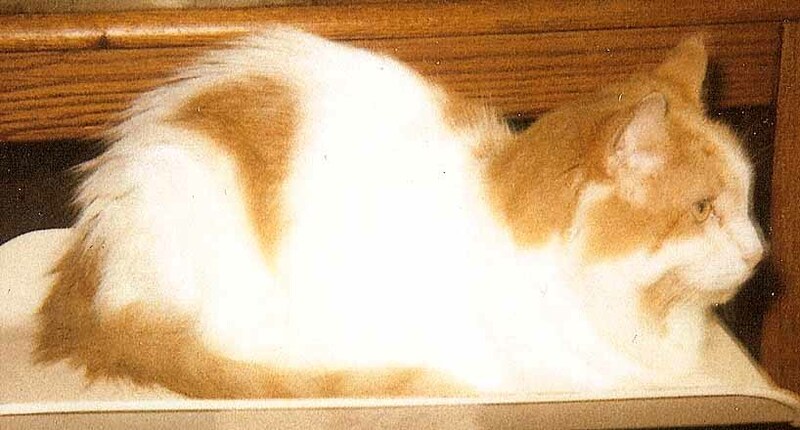 Cin was the last surviving member of the happy furry family Judy had shared her life with for many years. When her Bulldog, Jeremy, died unexpectedly on Christmas Eve 2008, the loss was unbearable for Judy…and also for Cin. The two boys had been best buddies. So last year Judy, who is a long time supporter of Bulldog rescue, brought home two Bullie ladies who needed a forever home. The hope was these sweet girls might be interested in making friends with a beautiful orange and white cat. Cin did everything possible to forge a friendship with his new canine family members, but the dogs just weren’t interested. So he contented himself by playing with his toys, sleeping in his cat nest, and staying close to Judy. He held his own through 2009, but when 2010 rolled around Judy started to notice that Cin just wasn’t Cin anymore. He was losing weight. He had begun sleeping in Jeremy’s old resting spots. The playful cat she had known was disappearing before her eyes. Then, about a month ago, things started to go very wrong, very fast. A team of doctors did every possible test they could think of, but no one could come up with any conclusive answers as to what was wrong with Cinnamin. His frail little body was shutting down. On April 13th Judy made the heartbreaking decision to let her boy go. Medicine has come a long way. There are tests and treatments available that can often save or extend an animal’s life. There are drugs that can relieve pain, help old kidneys, and fight cancer. But Judy feels Cin died of a broken heart…and there just doesn’t seem to be a medicine for that. Sometimes our own grief is so deep we don’t notice it in others; I nearly missed this in my Cookie after we lost Sophie, and Stanley had been slowly failing and we lost him almost two months later. Cookie lost her (reluctant) best friend and I was out there too. Good thing Cookie’s a strong kitty and I came back to the fold in time. I think you may be right,Bernadette. I’m SO glad Cookie was strong enough to wait for “Mom” to come back to the fold, but I’m very sorry about Stanley. Give Cookie a hug from me! I truly believe an animal can die of a broken heart. Many years ago when my dad met his new wife she and her tiny pampered,indoor, high dollar lap dog Mickey moved in with us and our two scruffy outdoor hounds. Over the years he bonded closely with our male dog and bacame as scruffy as him. Our female dog eventually died and the two boys went on for two more years. When Max (one of our hounds) died Mickey’s grief was obvious; he spent the next 6 months laying down next to the dog house and his eyes and feet were always soaked with tears. You could actually see the tears well in his eyes. Early on my dad got a puppy and they would snuggle and Mickey would sigh sadly but never recovered. It was a relief to see him go because we knew he wanted to be with Max.